Portable Tiki Torch Copper Cone. Portable Tiki Torch Copper Cone are a must have to give you that feeling of a Tropical Oasis. Backyard Blaze offers you a full line of Portable Tiki Torches to use around your landscape and give off that Dazzle that is missing. 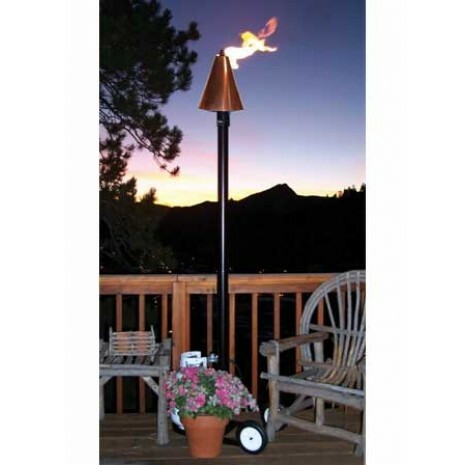 All Portable Tiki Torches come with a dolly rack to mount your Propane tank to giving you fuel where ever you go with a secure strap to hold your propane tank. Push button Ignition and a variable Flame Control these Portable Tiki Torches are the whole package. When you are finished using these Portable Tiki Torches simply store them away for the next use. 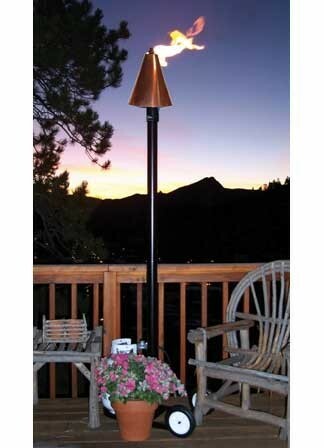 We offer our Portable Tiki Torches 5 Different Style one of them is sure to meet your Outdoor Design. 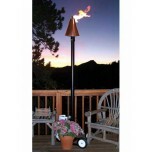 To learn more visit one of the Portable Tiki Torches that you like. Note: Propane Tank sold Separately.